Goodbye to sensible motoring – HubNut – celebrating the average! Today, I have waved goodbye to the most sensible car I’ve ever bought. 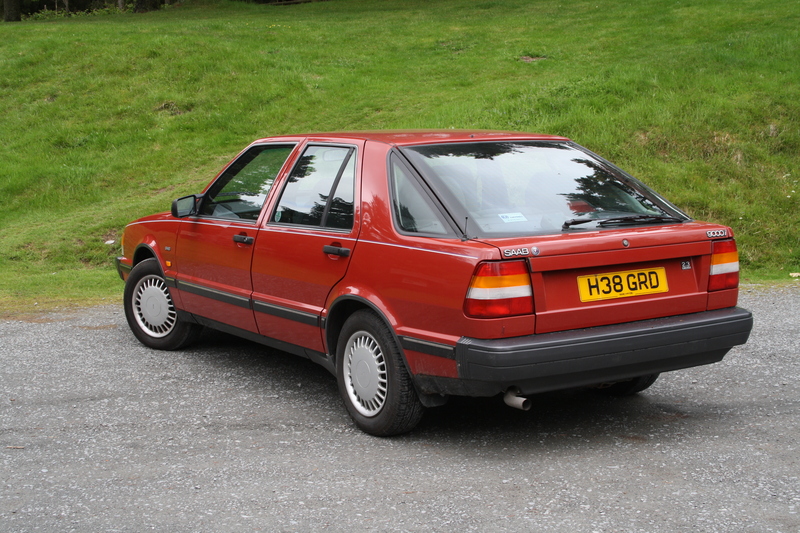 My Saab 9000i 16v was bought to do a job, and it did it admirably. On one crazy weekend, we clocked up 700 miles driving to various family functions in the UK, including driving from home in West Wales to the curious landscape of Norfolk. For that journey, the car made perfect sense. Rarely for one of my motors, it was supremely quiet, quick and entirely reliable. It then ended up on another 500 mile weekend trip to Devon and back, before proving to be the ideal vehicle for a wedding in Wiltshire. The enormous boot was useful as we were helping to organise the event while the rear seat offers luxurious comfort to those asked to sit there. Then there was all the ‘convenience’ features. Heated seats, heated mirrors and electric everything. The economy wasn’t bad either – averaging 32-34mpg. Not bad for a 150bhp 2.3 four-pot. It started every time it was asked to and ran like clockwork. Everything worked all of the time – from the headlamp wipers to the seatbelt buckles that light up in the dark. The price for all this efficiency was a complete and total lack of character. It wasn’t a car to excite. In fact, when it came to dealing with Welsh roads, it was a car that failed to satisfy at all. Typical of multi-valve engines, there’s no grunt unless you extend the revs and the steering was about as accurate as a monthly weather forecast. Mix in a frustratingly jiggly ride and a clunky gearchange and it was obvious that with its job done, the Saab would have to go. As often said at the end of a doomed relationship though, the problem wasn’t with anything she had done, it was with me. The grumblings in no way got close to matching the number of plus points and the Saab is certainly no worse than many other modern cars in those regards. Romance just didn’t blossom. I really am the problem. The Saab has gone, yet I still own a semi-functioning Range Rover, which I’m starting to like a great deal. Why on earth do I rate a ropey, battered off-roader ahead of a super-efficient Swedish luxo-barge? The list of non-working toys on the Range Rover is almost as long as the list of cars I have owned. Ever. The clutch feels funny. The steering is all wobbly. The heater blower doesn’t work at all – handy for Winter – and the interior is built with the sort of plastics you’d complain about if you found them as part of a toy in a Christmas cracker. Kinder surpise is aeons ahead. Thing is, for all its faults – and there are many – the Range Rover puts a smile on my face. It’s hard to argue with that basic fact.